What game engines are supported? Do you have any relationship with KADOKAWA Co., Ltd., or SilverSecond? Do you have any relationship with Naoki Takahashi? Do you have any relationship with Clickteam? Can you tell me the process for publishing a game? I want to stop the publishing of a game, what can I do? Do you screen which games get to be published? There was a bug in the game – how can I update it? There was an upload error. There was an upload error using an above listed Wolf RPG Editor file. When I want to use RTP, what should I do? Is it OK to upload an unencrypted zip file? I want to delete copyrighted material that was uploaded without permission. What is the user box? My newly uploaded game does not appear in the New Release section. Who do I report errors to? Is there a required upload file format? The sound quality of the midi file changes. A midi file loops at a strange place. Please tell me the midi source being used in the game engine. The sound quality of .ogg and .wav files degrades. The game I created and the uploaded game are acting differently. I can’t use MIDI for a game event. There’s no game cursor on my Android device. Which parts of RPG Maker 2000 are incompatible? Which parts of Wolf RPG Editor are incompatible? Which parts of NScripter are incompatible? Which parts of RPG Maker VX Ace are incompatible? Q.What game engines are supported? In PLiCy, it is possible to operate games made with RPG Maker 2000, Wolf RPG Editor (later 2.10β), and NScripter. PLiCy has an operating engine which is compatible with the above engines, so you can simply play games on a PC browser or Android app by uploading in a compressed zip file. Additionally, the games made by Clickteam Fusion 2.5 are also supported for upload. Novel game production software pli-log and action game production software Game Designer Action are used in PLiCy. You can create games with these game editors on both PC and smartphone, and the games work with either PC browser or smartphone browser. Goods, services, etc. that are posted on this site are trademarks or registered trademarks of their respective owners. Q.Do you have any relationship with KADOKAWA Co., Ltd., or SilverSecond? We have no direct relation. PLiCy contacted KADOKAWA CORPORATION ENTERBRAIN Brand Company (Now KADOKAWA Inc.) and SilverSecond when we were developing the PLiCy site. We’ve had contact with these companies and they are aware of our services at PLiCy. However, these companies are not responsible for the development or operation of PLiCy. We ask that any contact regarding PLiCy, including questions and requests, not be directed towards these companies. Any engine development issues, questions, or bug reports can be sent to PLiCy. Q.Do you have any relationship with Naoki Takahashi? Q. Do you have any relationship with Clickteam? PLiCy is authorized to use Degica Co., Ltd.’s Clickteam Fusion 2.5 Indie game creator. Q.Can you tell me the process for publishing a game? 1. Prepare the game you want to publish. 2. Compress the game into a zip file. 4. PLiCy will process the file for use (depending on data size, this can take between 5 minutes and 1 hour). 5. When the conversion is finished, the Setup button will appear on MyPage. 6. After Setup, the game can be test played, then a thumbnail selected. 7. The game is then automatically published. Q.I want to stop the publishing of a game, what can I do? When you delete a game, it will also immediately stop being published. Also, once you delete a game, you will not be able to recover it. Because PLiCy does not get involved in deleting, you can feel free to delete your work. Q.Do you screen which games get to be published? In order to run smoothly, PLiCy has automated all game publishing functions. PLiCy staff will not be involved in any game selection functions. Additionally, due to the automated nature of the site, it’s possible to publish games 24 hours a day, 365 days a year. Because PLiCy does not get involved in editing, you can feel free to publish your work. Q.There was a bug in the game – how can I update it? PLiCy has automated all the update functions for a streamlined experience. Simply go to MyPage and click the Update button. Due to the automated nature of the site, it’s possible to update games 24 hours a day, 365 days a year. Because PLiCy does not get involved in updating, you can feel free to update your work. You can upload games after you Login. If you can’t Login, you may need to Sign Up. Please upload your zip compressed game with the Game Register in the upper right corner. Q.There was an upload error. Check the contents of the zip file. Encrypted uploads cannot be processed, so don’t use encryption. Below are the supported file formats. Q.There was an upload error using an above listed Wolf RPG Editor file. 2.10β is not compatible with previous versions. If the game was made with a previous version, use the current version 2.10β editor. Then change the followings "Tile set editor", "Game basic settings", "System Database", "Variable database", "User database" more than once and save the data and upload in a .zip file. Q.When I want to use RTP, what should I do? RTP rights are retained by KADOKAWA Co., Ltd., thus we are unable to publicly provide RTP as a PLiCy service. 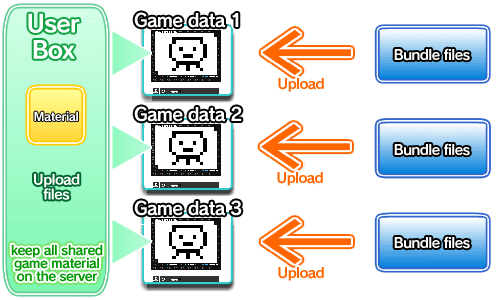 However, If you would like to use RTP in RPG Maker 2000, you can upload RTP and publish that individually. Therefore, please bundle RTP in the game, or upload it to the user box. Q.Is it OK to upload an unencrypted zip file? In PLiCy you can enable/disable zip distribution. If you set to “disable zip distribution”, the uploaded file will not be distributed. With this setting, it is possible to not distribute an unencrypted zip file while the game can be played on the site. Q. I want to delete copyrighted material that was uploaded without permission. Game play screen＞Report Copyright＞ [Copyright Infringement]. Q.What is the User Box? The user box is a system to collectively manage frequently used material on the site. 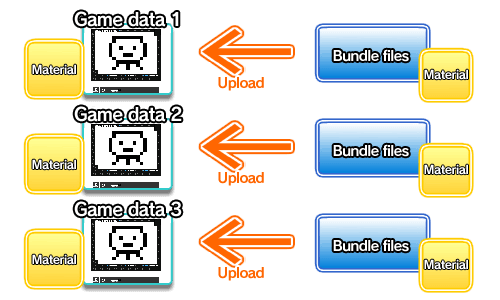 Usually, you need to bundle files of images and music materials in the game data. Prviously, If you want to use the same material in other games, you have to prepare duplicate game data. So PLiCy made a UserBox. In UserBox, you can keep all shared game material on the server, and then it is applied to other games automatically. By uploading files to UserBox on Profile in MyPage, you can use the materials in different games. With UserBox you can simplify your work of putting the same files in the game. It is also possible to use RTP as a UserBox file. Please put the materials in the appropriate folders based on each tool. If you're not sure how to do this, you can put a file in the relevant part of the sample folders below. Users who have not setup the UserBox can still enjoy playing games. Q.My newly uploaded game does not appear in the New Release section. Only 3 games per person are allowed to display in the New Release section. This is to allow all users to have a chance to showcase their games. Q.Who do I report errors to? The Report Error button is located on the bottom of the game screen. Q.Is there a required upload file format? No.（Except for encrypted Wolf RPG Editor). In PLiCy, image files .png, .jpg, .bmp, .xyz (RPG Maker 2000 format only). The audio file is compatible with mid, mp3, ogg, wav, and au formats. You don’t need to covert these files when you upload. Q.The sound quality of the midi file changes. The actual sound quality can change slightly when used in PLiCy. If you prepare several formats of the same file type,midi＞mp3＞ogg＞wav, they will be used in alphabetical order. Q.A midi file loops at a strange place. PLiCy can process midi files, but occasionally these may loop at a strange place. In such cases, try using a different file format. Q.Please tell me the midi source being used in the game engine. Q.The sound quality of .ogg and .wav files degrades. Not as bad as midi format、but the sound quality of ogg、and wav files may slightly change. PLiCy is not a video sharing site, and at the moment cannot support HD video. Since it’s using a browser, it is not suitable to run process-intensive games. Therefor it is better to avoid operations which contain many parallel events and commands running constantly. However, since we also want a smooth experience, please contact us and well see if we can help. Q.The game I created and the uploaded game are acting differently. Since there is a possibility of bugs, please contact us. Q. I can’t use MIDI for a game event. Q.There’s no game cursor on my Android device. If no cursor is programmed, it will not appear. If you need to use direction keys, please describe such as direction keys or up down right left. Q.What types of games do you have? These are general categories, mainly for searching for games. It's okay if you accidentally put it in the wrong section. Q.Which parts of RPG Maker 2000 are incompatible? The exact experience curve (we use the pseudo – experience value curve in PLiCy). General games using the main character's information. While you're displaying the picture, put the wait process before it finishes loading (streaming). Q.Which parts of Wolf RPG editor are incompatible? You can't use your own font. We don't recommend no anti-aliasing and doublewidth. You will not be able to set the random number using the seed value. Four point coordinates drawing for display. Map looping (planning as a future feature). Font change in center, right-justified, resize, etc. No more than four buttons on the gamepad input. Using songs from the CD (play/playstop/playonce/cdfadeout/chkcdfile/chkcdfile_ex) (MIDI not from a CD is acceptable). A process for performing a program (shell/winexec). Q.Which parts of RPG Maker VX Ace are incompatible?